Submitted by mainadmin on Monday, July 21, 2014 - 10:10. We all want healthy hair, and its sometimes hard to achieve. One major reason for this: split ends! Here are a few of our favorite healthy ways to get rid of split ends at home that don’t involve cutting your hair! Use a Papaya Hair Pack! Hair.AllWomenStalk.com states that a perfect way to get rid of split ends is by halving half a papaya, getting rid of the skin and seeds and blending it until its puply. After, add half a cup of plain yogurt and mix it again. Massage this into your hair and allow it to sit for thirty minutes. Mix Oils Together! Mix equal parts of castor oil, olive oil and mustard oil. Then- apply the mixture to your hair! Leave this in for thirty minutes and don’t forget to wash all of the oil out with a shampoo! Use a cream tonic! After shampooing, mix a tablespoon of heavy cream into half a cup of milk. Beat this mix thoroughly and then apply it to the ends of your hair! Allow it to sit for fifteen minutes before rinsing it out! Honey! Mix honey with curd and massage it into your split ends. Leave this in your hair for twenty minutes! Massage in Avocado! This method is easy. 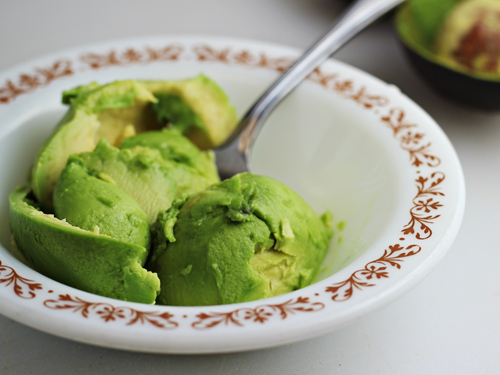 Just smooth avocado into the ends of your hair and let it sit for fifteen minutes to an hour. Use Mayonnaise! According to HomeRemedyShop.com, by applying this in your hair twice a week you are fighting against split ends! Use a banana mix! Mash a ripe banana and add honey, egg and milk to create a paste. Apply it as a hair mask and wash it out after half an hour! These are just a few of the many at-home remedies for split ends that you should check out and try! Submitted by mainadmin on Wednesday, July 16, 2014 - 13:35. Many people don’t recognize soy milk as more than a lactose-free alternative to milk. People don’t understand that the protein found in soy milk has several health benefits- especially for your hair! Here are a few reasons why you should consider soy milk. It strengthens your hair! According to Livestrong.com, drinking soy milk, or even using soy milk-based products on your hair, you are reducing the chances of your hair breaking or falling out. Use soy milk to help grow out your hair and make it stronger! It repairs split ends! Using a soy-based product on your hair can help converge split ends. Likewise, consuming soy milk can help repair muscle and skin tissue. It moisturizes your hair! To achieve glossy and healthy-looking hair, drink some soy milk! It provides your hair with protein and hydrates your hair!